That one got me right in the feels. @Jolee Bindo, the more accurate it is, the harder it hits you. @Tyler643, Personally, I just love the hype surrounding Star Wars. Each trilogy, series, and standalone has their own unique feel, so figure out what you enjoy without buying into all the reviews first. Even though it’s not in the movie line-up, I suggest checking out Clone Wars too! I haven’t seen Rebels. @PBnJ, The Clone Wars is a fvcking phenomenal show (as is the 2D one). And rebels is good, but has a lot of filler. @Tyler643, I agree with PBnJ don’t read any of the reviews and watch all of the films to form your own opinions. Star Wars is unique because some people in the fandom absolutely love one trilogy and dislike the other ones and vise versa. In the end there is pretty much something for everyone with the saga as the whole. I highly recommend it. And if you end up liking the movies, the clone wars are indeed worth a watch. The first few seasons are kind of kiddy, but the show really grew with its audience and matured a lot after the first few seasons. @Tyler643, don’t bother, watching too many appears to kill your childhood. I love how much dedication Star Wars fandom has for stuff like this I’m still convinced they made solo to explain how han made the kessel rum in 12 parsecs since it’s distance not time. And explain why that’s an accomplishment. This isn’t deep though.... this is such a surface level interpretation of this line.... we understand all of this the moment we find out Ben is actually Obi Wan. and the prequel adds NOTHING to this. We know that Ben is speaking in metaphors here once we find out he’s actually Obi Wan. and even Return of the Jedi, he explains that Darth Vader METAPHORICALLY killed Anakin. This post was made by someone who understood a very basic concept and thought they were a genius for it. 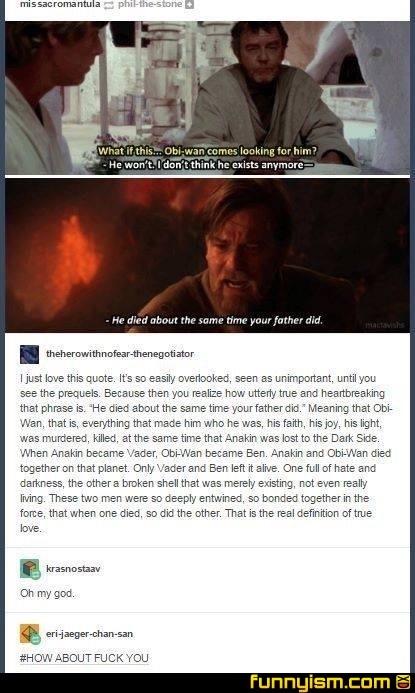 @MrTsquared, this isn't Ben saying Obi Wan died, it's Luke's uncle, who knows that Kenobi is still alive. The same uncle who also said "that's what I'm afraid of" when Luke's aunt told him that he was like his father. And something you might not realize is that this line doesn't seen like it has any significance unless you've seen the prequels and original trilogy, and that it's a very easy line to miss because of little emphasis the movie places on it. Something else you might not realize is that there's no need to be condescending just because something that wasn't obvious to other people seems obvious to you. Or it’s just a convenient way to account for Lucas rewriting the original history and trying to fix all the paradoxes it caused. Or maybe he was just hiding the truth from Luke, you know, like he had been his whole life. A lot these come down to Obi Wans comment about a certain point of view. Two soul shattering identity changes took place, both of them died, from a certain point of view.